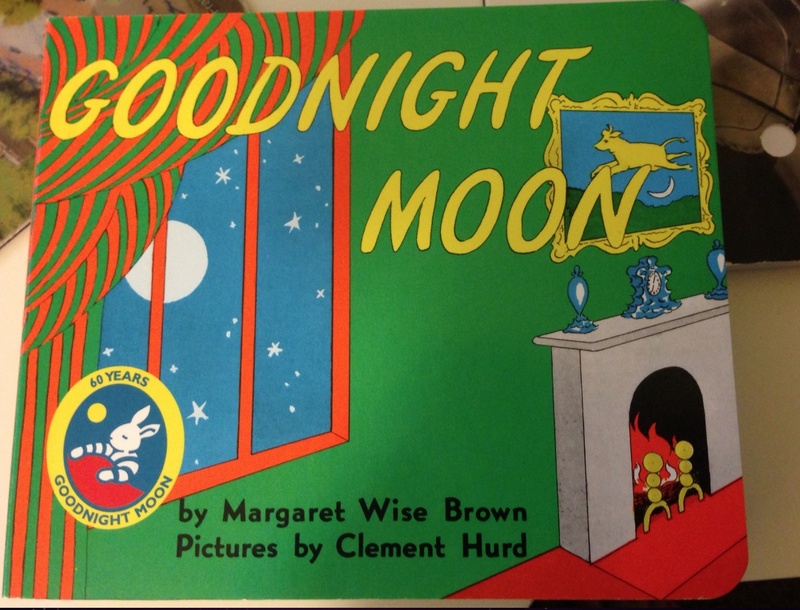 Goodnight, Moon, by Margaret Wise Brown (1947) with pictures by Clement Hurd, is a classic piece of children’s literature often given as a baby shower present in board book form. According to Wikipedia, it was one of the “Top 100 Picture Books” of all time in a 2012 poll by School Library Journal. Let us fast forward to 2011. 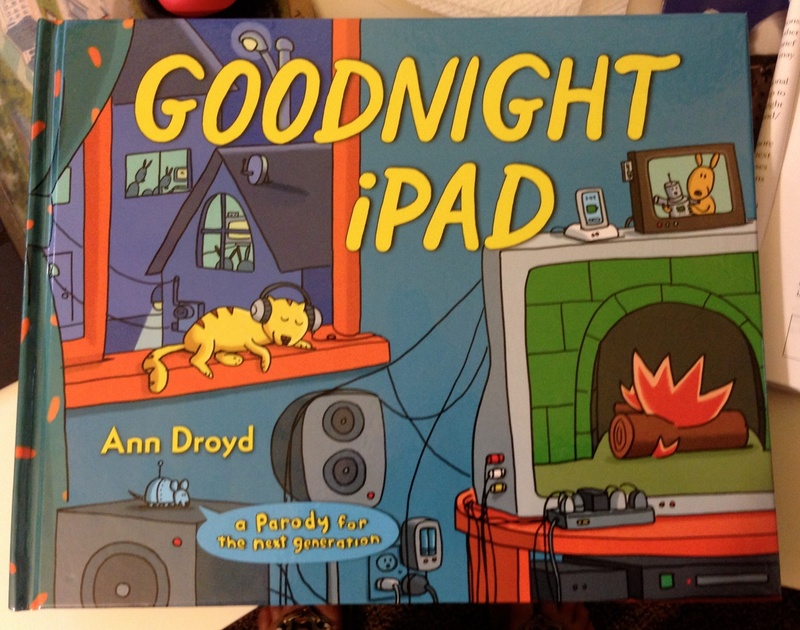 A new book makes the scene, called, Goodnight, iPad, by Ann Droyd (surely a pseudonym)*, published by Blue Rider Press (Penguin Group). In this book, instead of a little old lady saying “hush,” there is a little old lady trying to sleep. Why can’t she sleep? Because in a “bright buzzing room” there are a number of electronic devices being use by critters vaguely resembling bunnies (think baby “minions”) who are wide awake. Even the fireplace is a giant TV with a “virtual” fire. Eminem is singing as a ringtone for a mobile phone and there are taps that signal text messages “with no end.” The old lady has had it! She gathers up their devices and throws them out the window, saying “Goodnight” to each of them, while ignoring some pretty dramatic protests from the bunnies/minions. She tucks them all in bed and now she can, at last, sleep in peace and quiet. 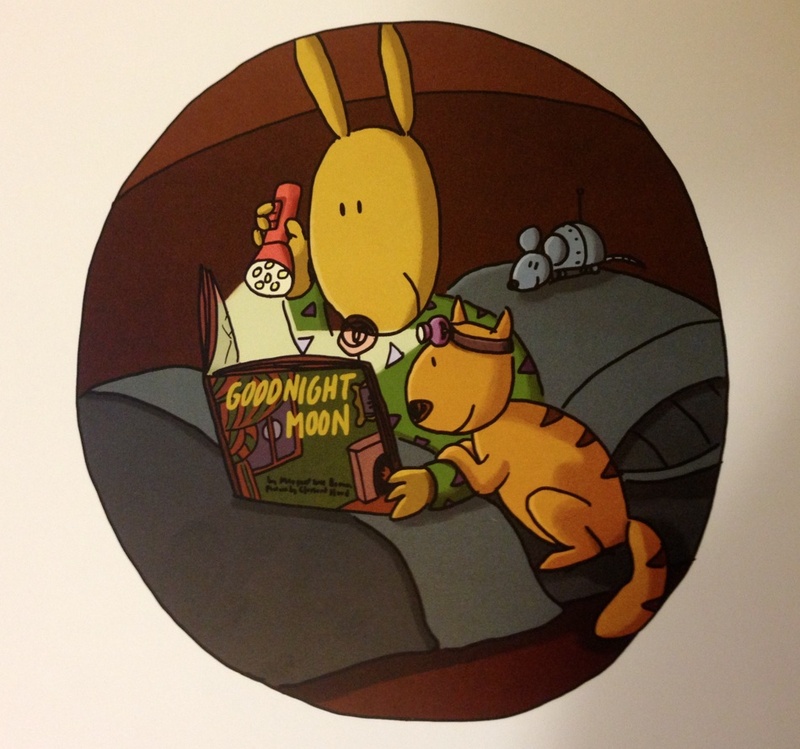 The last panel is one of the little guys in bed with a book, a flashlight, a cat, and a mouse. What are they reading? Goodnight, Moon, of course! What can we take away from a comparison of these two iconic books? First, our lives have changed irretrievably in terms of everyday activities. Technology, which Don Leu described as “deictic” or constantly changing over a decade ago (Leu, 2000), has unmistakably gathered momentum and may be seen as revolutionary rather than evolutionary. Second, EVERYONE, virtually without exception, around the entire planet, is involved in the revolution. Mobile devices, tablets, Youtube, social networking sites, e-games, and LCD HDTVs, ringtones and texting, Twitter, and so on….digital literacies! Third, we have technophobes who gloomily predict the end of civilization as we know it (Goodnight, iPad seems to fit) contrasted with technogeeks, who want more changes faster and see the resulting energy as a renaissance and a leveling of society (Gorbis, 2013). Who do we believe? Finally, what does this mean to education? Kevin Leander (2009) has characterized the responses that educators (and others) have to the changes we are experiencing. He notes four types of response to digital literacies: (1) resistance or steadfast adherence to print-based literacies; (2) replacement, or discounting of print-based literacies; (3) return, or valuing of digital literacies only as they support print literacies; and (4) remediation, or the attempt to redefine literacy learning through adoption of a “parallel” pedagogy that values both print and digital literacies. I was trying to decide my own stance on “literacies” and found myself in the remediation phase. Interesting that, for the first time in my life, I am in remediation! But literacies are social as well as academic and the popularization of online communication has brought that further into focus. Are we headed for an era when so-called “school literacies” are denigrated to the resistance phase? Needless to say, I don’t have the answers, but I do have some observations on how literacy proceeds in the early years and how technology is involved in that development. The observations are of my own children and grandchildren and while that is not at all scientific, there are some semi-respectable precedents for it (think Skinner box). When my son, who is a pilot in the Army National Guard, was sent on a second tour of duty in Afghanistan in 2012, he left behind his wife and a two-week old baby son. This tour of Afghanistan differed greatly from his first tour in 2003, when letters (pen and paper) and emails were the extent of communication. Once, when a Blackhawk helicopter crashed, he was allowed to phone home to tell his parents that it did not involve him. That was revolutionary at the time. On this tour, he was able to purchase reliable Internet time in his quarters on the base in Bagram and Apple technology allowed him to Facetime almost daily with his wife. In addition, they purchased a camera system that worked with iPad and iPhone and he was able to observe the baby in his crib. In terms of more traditional literacies and technology, he purchased a book about dads and babies and audio-recorded his voice so that he could “read” to his son while deployed. 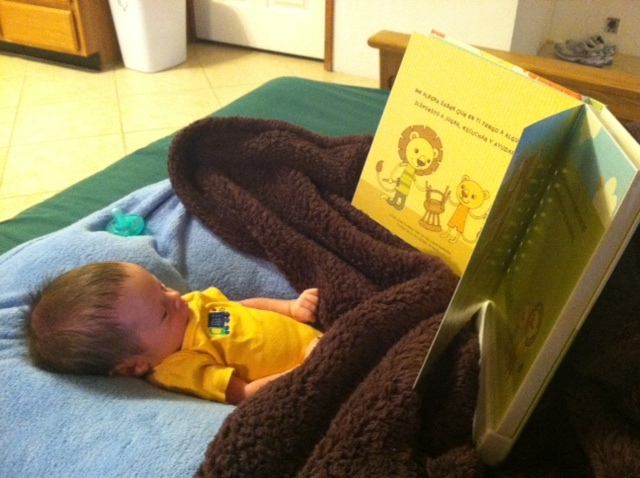 Attached is a picture of the baby listening to his father “read” the book. Happily, my son came home safely and now reads “real” books to his son, including his favorite Red Truck (Hamilton, 2008). Can Red Truck make it up the hill? Red Truck can! Red Truck will! ZOOOM! Red truck goes to the rescue and when my son reads to my grandson, they make the sounds dramatically together. 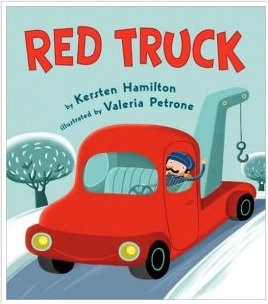 Incidentally, Red Truck is available as an ebook. I also have twin granddaughters who are now four and a half. In my September 2012 Literacy Beat blog, I shared a picture entitled “Digital Morning,” which I’m reposting below. 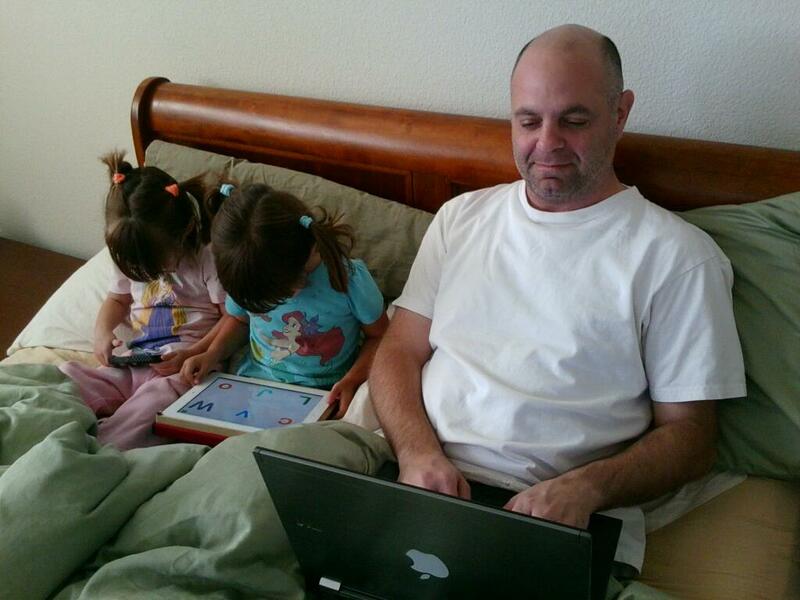 You can see Dad on his laptop, and the twins–one on an iPad and one on an iPhone. The twins love to read print books, but they also love to explore literacy online. Both of them LOVE the iPad and use it for lots of things, such as puzzles, art, coloring, and literacy learning. Recently, they have been exploring two Apps, Reading Ravens (http://www.readingraven.com/ ) and Hooked on Phonics (https://itunes.apple.com/us/app/hooked-on-phonics-learn-to/id588868907?mt=8). Both provide experiences with phonological awareness, with phonics, with word patterns, tracing letters on the screen, and with beginning reading. Both are interactive in different ways. Both take very different paths to the same end. Both are very engaging to my four-year-old granddaughters. In my next post, I will explore these two Apps and provide a list of resources for early literacy development. I began this column with the book Goodnight, iPad because iPads play an increasing role in literacy these days. One resource that I have found valuable is Using Apps for Learning with Literacy Across the Curriculum, by Rick Beach and David O’Brien (2012). In a review of the ebook, Don Leu termed the increasing use of iPads as “…perhaps the most profound change taking place in literacy and learning today” (p. ii). Naturally, I downloaded this book to my iPad and it offers a useful framework for thinking about how to employ the apps across grade levels and content/discipline areas. They include an Apps for Learning with Literacy website and a resource Wiki for readers. Last each of 12 chapters provides a wealth of resources for educators. Enjoy! * Actually by David Milgrim, an author, illustrator, and cartoonist, who is “very interested in how we got to be who we are.” Check him out at http://www.davidmilgrim.com. Beach, R. & O’Brien, D. (2012). Using apps for learning with literacy acros the curriculum. Gorbis, M. (2013). The nature of the future: Dispatches from the socialstructed world. New York: Free Press. Leander, K. (2009). Composing with old and new media: Toward a parallel pedagogy. In V. Carringtron and M. Robinson (Eds. ), Digital literacies: Social Learning and classroom practices (pp. 147-162). Los Angeles, CA: Sage. Leu, D. J., Jr. (2000). Literacy and technology: Deictic consequences for literacy education in an information age. In M. L. Kamil, P. Mosenthal, P.D. Pearson, and R. Barr (Eds. ), Handbook of Reading Research, (Vol. 3, pp. 743-770). Mahwah, NJ: Erlbaum. PS. Love the photos of the children. Loved this column! I hadn’t seen Goodnight iPad yet. Next week I am heading the the Ebooks in Early Learning: Science, Design, Decision conference next week. I will share your column! The adaptations of books and concepts to fit into the society that our children live in now is something that I find to be very appropriate. This gives light into what our children are exposed to in terms of technology. It also shows that there is a time and a place for said technology. Allowing children to see that there is a “good night” time for the iPad makes it a more realistic approach. Teaching children that turning our technology off is an idea that should be focused on in every household. We get so caught up in our daily lives and technology that we do not see the reality behind the lack of social encounters due to its use. Typically, I do not look at articles that are about books or literature that is for younger children due to the fact that I teach high school students. However, I am so very glad that I came across this article while perusing the site. I recognized the book from the many times that I’ve been at baby showers or from when I was observing as an undergrad trying to determine the grades that I would like to focus on. I was not aware of the second book at all, and find it fascinating. I love adaptation to our lives today and how so much has changed. However, I still love the original. I do believe that the change does put into perspective how much has changed in so little time and how easily our students can access the literature if they would like to. Many times in the classroom, I have been able to catch a students attention and get them to read more simply because I used the iPad version of a text instead of simply the book. However, I do have those students that truly prefer a book with real pages in their hands. I like that we now have options and can supply our students with what suits them best. Thank you, Candace, for this thoughtful post and making the connection to history. I agree with you and think that for older students it could serve as an intro to a then and now essay!